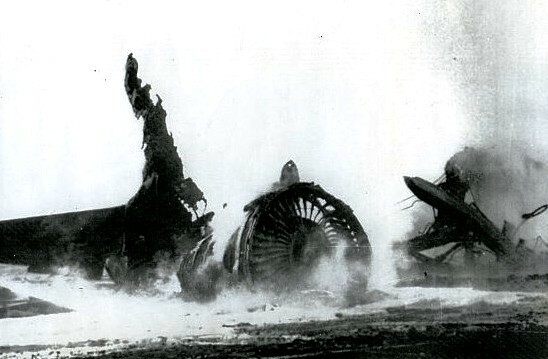 Remains of hijacked Pan Am Flight 93, N752PA “Clipper Fortune” a Boeing 747 after being blown up at Cairo. On 6 September 1970, Pan Am’s flight 93, a Boeing 747, departed Brussels for New York via Amsterdam. The flight never made it to New York. During the flight’s stopover in Amsterdam, four members of the Popular Front for the Liberation of Palestine (“PFLP”) attempted to board an El Al flight, a Boeing 707 bound for New York. Two got through but the other two were denied by Israeli security. These two then purchased First Class tickets on flight 93. On the same day in Frankfurt, another group of PFLP members boarded TWA Flight 741, a Boeing 707 bound for New York; and in Zurich, members also boarded a Swissair DC-8 bound to New York as well. The Pan Am, TWA and Swissair flights were hijacked. An attempt to hijack the El Al flight was foiled by the crew and a sky marshal. The TWA and Swissair flights were flown to and eventually landed at the PFLP’s “Revolutionary Airport” at Dawson’s Field, a remote desert airstrip in Jordan, formerly a British Royal Air Force base. The Pan Am flight was flown to Beirut, where it refueled and took on board additional PFLP members. The aircraft then flew on to Cairo instead of Dawson’s Field, because the Jordan airfield was considered too small to accommodate a 747. 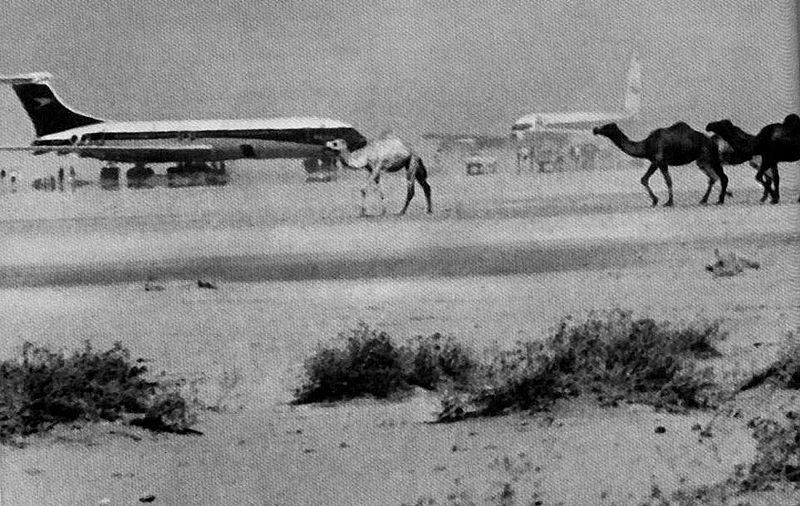 On 9 September, a BOAC (now British Airways) VC-10 bound for London was hijacked after it departed from Bahrain and was taken to Dawson’s Field. This became known as the “Dawson’s Field Hijacking”. 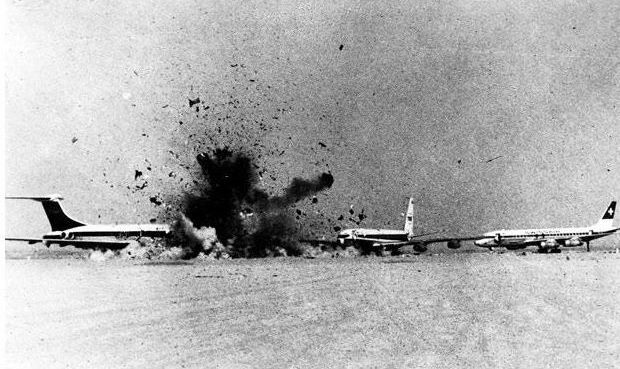 The BOAC, TWA and Swissair aircraft were blown up on September 12, 1970 (below). The Pan Am aircraft, upon arrival in Cairo, was blown up almost immediately. The late John Ferruggio was the In-Flight Director, and having been told the 747 would be blown up within eight minutes after landing, led his cabin crew team in the evacuation of 136 passengers and 17 crew-members. Everyone survived. Nellie Beckhans was a flight attendant on that trip, her first in Europe after years working Pan Am’s Central and South America routes. 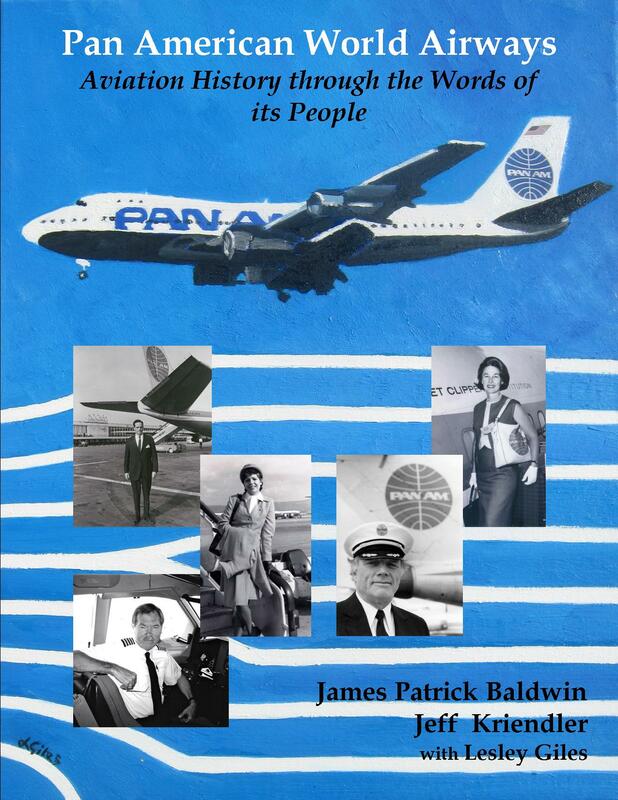 Below are excerpts from her story about this event that appears in the book Pan American World Airways – Aviation History Through the Words of its People, published by BlueWaterPress. “Much later I heard we were going to Beirut. * * * The hijackers wanted to go to Amman to blow up the plane. I remember flying and flying. Meanwhile a hijacker was stringing the dynamite fuses between the seats. * * * When the hijackers finally agreed to land in Cairo the In-flight Director called the crew together and informed us of the plan. * * * As soon as the plane stopped I opened R4 door and the passengers evacuated. When I was going down the chute the airplane moved and I went off the slide. * * * It was a happy moment when we heard everyone got off the airplane. We lost our possessions and our shoes but we were alive and safe. Nelida (Perez) Beckhans was based in New York from 1967 to 1970 as a Special Services Representative and from 1970 to 1982 as a Flight Attendant. She transferred to Miami in 1982 and was stationed there through 1991. Her length of service with Pan Am was 24 years and 8 months. Pan American World Airways – Aviation History Through the Words of its People, cover pictured below, is a collection of essays written by the people of Pan Am, the pilots, the flight attendants, the station managers and other staff who participated in the history making events that arguably made Pan Am the greatest airline that ever was—and certainly the most renowned and celebrated. Among the 71 essays are recollections of the inaugural flights of the Boeing 707 and 747, the flight that brought the Beatles to the United States for their appearance on the Ed Sullivan Show and flights carrying dignitaries such as Winston Churchill and Mother Teresa. Other stories recall Pan Am’s involvement in the rescue of orphans during the Viet Nam War and the final closing of its Saigon Station. There are personal recollections of hijackings, Presidential Press charters, the sale of Pan Am’s Pacific routes and the merger with National Airlines. Finally is the narrative by the pilot who was captain on Pan Am’s last revenue flight on December 4, 1991. These stories and much more are included in this book and any student or fan of aviation will find a treasure trove of history and memories. More information about Pan American World Airways History can be found on the website of the Pan Am Historical Foundation.